Copyright © 1997-2014 by Michael I. Holmes. All rights reserved, not for reproduction. 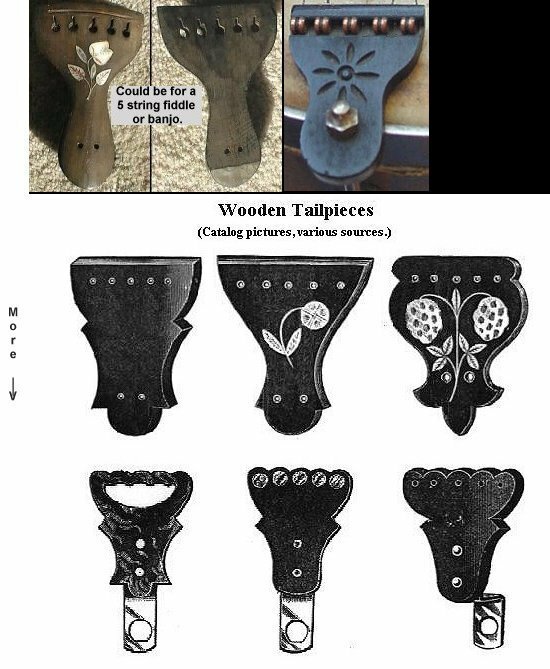 Readers are requested to help identify the unmarked tailpieces at the end of this article, and to send images of any others, for inclusion in the list. If you don't have access to computer generated pictures, send them to me snail mail and I'll scan them in. 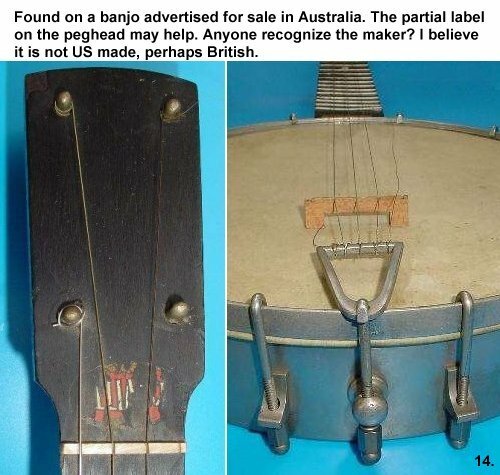 Found on a banjo advertised for sale in Australia. The partial label on the peghead may help. Anyone recognize the maker? I believe it is not US made, perhaps British. 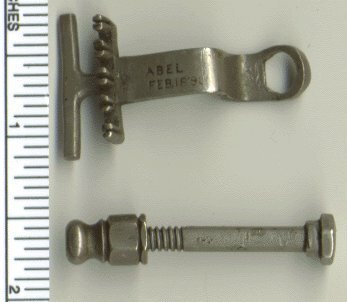 Abel, patented Feb. 18, 1890 by Wilfred J. Abel in NYC. Bacon, E.O. 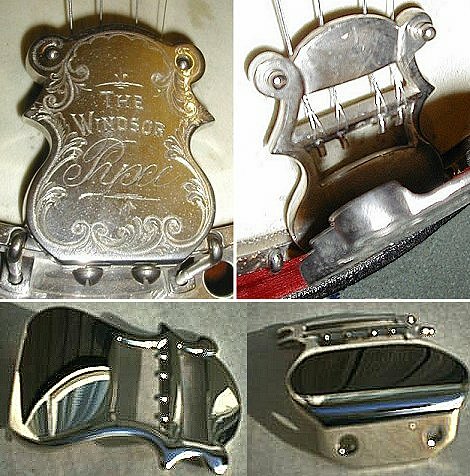 Winship was one of the original partners with Fred Bacon in the Bacon Banjo Company, Inc. in Groton, CT. His 1920s patent is found on FF Professional banjos and on some early Blue Ribbons. Baldwin purchased Ode in 1966 and continued using the same hardware. Here are a plain and two fancy, engraved models; most were plain. They were used on Ode, Muse, and Baldwin banjos. Barry Manufacturing Co, Philadelphia, PA made drums, tambourines, and in 1927 added tenor & ukulele banjos to their line. A 5 string banjo has been reported. This tp looks like a Weymann variant. 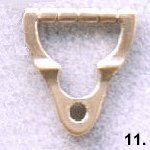 Bell brand, formed by bending a single piece of thin metal stock. Patented by the National Musical Strings Company (NMSCo), a 5-string an 8-string version. See also "Perfect Tailpiece." 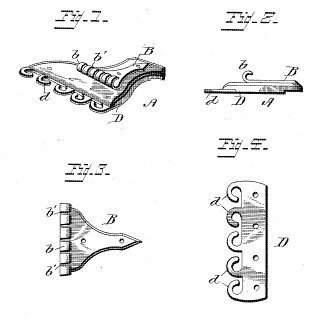 R. H. Benary's Patent, catalog description states "celluloid, imitation ivory, overhanging flange or pocket to cover knots of strings." It was also available in imitation amber, or with an artificial diamond inserted. 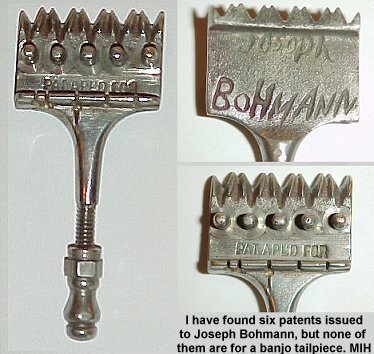 Joseph Bohmann is best known for his guitars, mandolins and violins, all of which earned him medals in international competition. He also offered banjos, but they were probably made by Schall and labeled. 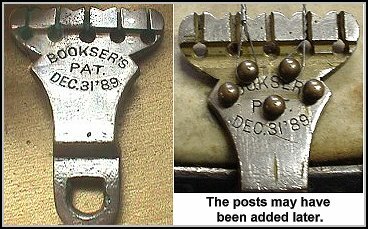 Bookser's patented December 31, 1889, seen on Buckbee and other banjos of the period. Also listed for sale as an after-market accessory. Thomas W. Bree, in New York City circa 1840, moved to San Francisco during the 1849 gold rush, where he continued making instruments and was still in business in 1890. 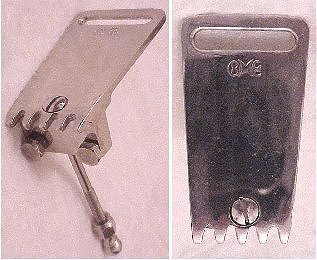 Chic tailpiece was inexpensive, pressed from sheet metal. The words visible in the picture appear to be the "Patent Applied For" statement. 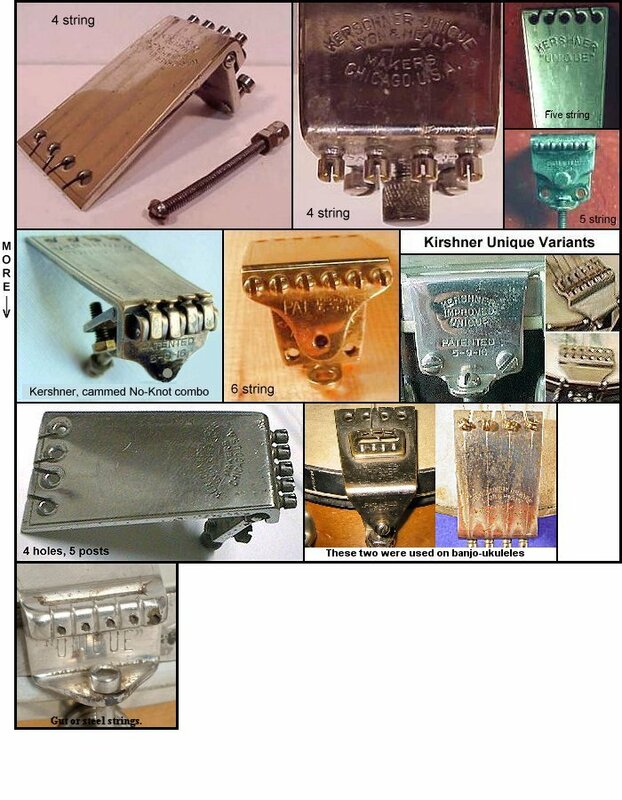 Frank B. Converse, assigned his 1903 tailpiece patent to Hamilton S. Gordon who distributed the Converse marked banjos made by Stratton and later, Buckbee and his successors. Edwin J, Cubley, Ravenswood, IL, found on his 1880s fretless banjos. Cubley is important as the man who provided banjos & guitars to the fledgling Lyon & Healy company, until they established their own factory. Stamped "Daisy" on the top and "Pat. Jan 26, '86" on the underside. The crossbar, where the strings would attach, is bent out of shape on this example. No such patent has been found. Patented January 4, 1887 by Frederick W. Danner of Ronald, MI. This is the patent drawing. Neither his tailpiece nor the banjo he patented have been seen. H.C. Dobson, patented 11/08/1881 and found on Dobson's banjos as well as Buckbees, the probable actual manufacturer of the Dobson-labeled instruments. See also "Victor" below. 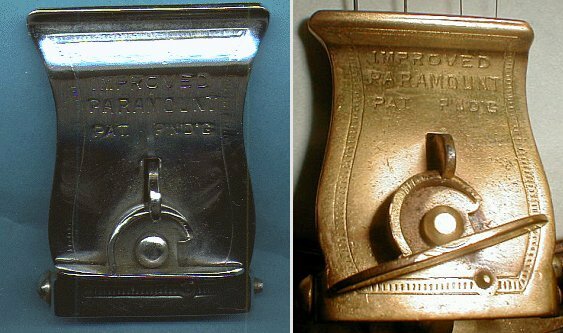 Elite first patented in 1895 by Edward Jacoby and assigned 1/2 to Charles S. Delano. Two models exist; the one with the two rows of 5 posts is the more common. See "No Knot" for string attaching instructions. 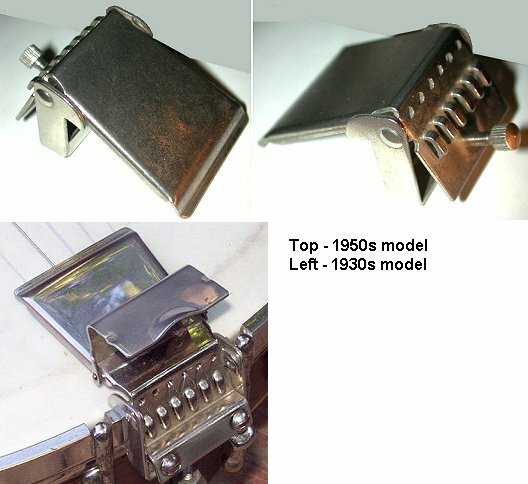 Elton, early models were heavier & had a hinged cover. 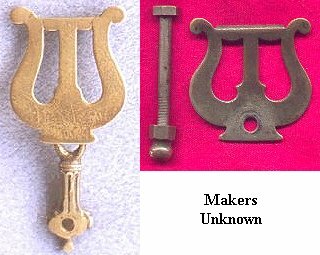 Found on low end instruments and some Vegas & Gibsons in the 1940s. Elton was a large accessories supplier from Elkington, IL. Eze-Tune stamped "Patent Applied For," it was issued 3/4/17. It was advertised by Sherman Clay Music, but the actual maker is unknown. Drawing shows how it works. Fairbanks & Cole (F&C), marked "Patented Sept. 21, 1886" but no such patent has been found. Made from ivoroid, a then-recently invented material, a substitute for elephant ivory. See Hodges. Seen on A.C. Fairbanks and on Bay State banjos, circa 1890s. Both were Boston makers. No patent or manufacturer indicated. Herschel Fenton, sold "Electric" brand banjos which were made for him by Buckbee, to whom he assigned his June 23, 1891 tailpiece patent. Fenton's banjos should not be confused with Fairbanks' "Electrics." Wm. Gerke, Providence, RI. patented Jan. 31,1888. Besides regular banjos, often found on Pollman Mandoline Banjos and Guitars. See also Thompson & Odell. Fred Gretsch, NYC circa 1920s. Found on student grade banjos marked Clarophone and Varsity. Later, they used tp's like the Paramount stamped with the Gretsch name. 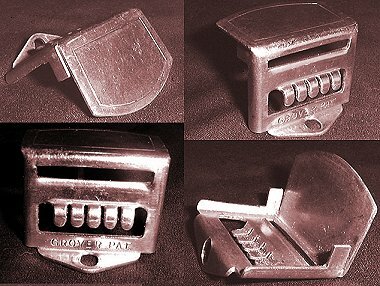 Grover Patent, Early version, pre-dates the Presto models, it has a cover that slides off, and 8 hooks allowing the tp to be used on banjos, banjo guitars, or banjo mandolins. Often no logo. 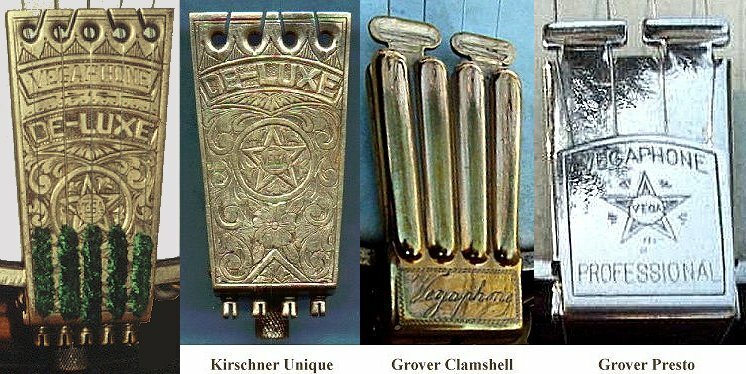 Grover Clamshell, found on many high-end banjos. Here are 2 gold plated and engraved examples, one from a 1930s Vegaphone and the other from a 1930s Epiphone Concert Recording model. Grover Presto, frequently used on mid-priced to better banjos, the 5 string model has a small, oval-shaped hole between the two extensions. The Presto Ideal is identical except for the name. Grover Presto, short form, 5 string and rare. Grover Reproduction, imported, 5 string version of one often found on Gibson, Vega and other banjos in the 20s, 30s, and 40s; this is a modern reproduction. 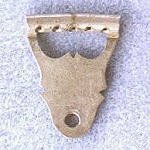 Grover simple tailpiece patented October 25, 1924. Frederick H. Hodges, Newport, RI. This is the patent for the date on the Fairbanks & Cole tp. It is not the same and none like this one have been seen. Another mystery! Lion Banjo Company, Rock Rapids, IA. Patent issued to company owner Hobart C. Middlebrooke, 12/13/1892. He received several more for inovations, all of which appear on his company's banjos. 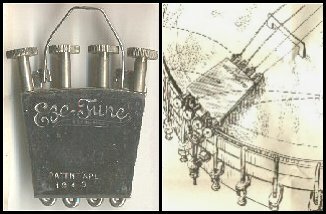 Lohman's Patent, identified in an 1885 Haynes catalog, no such patent has been found but several examples have been seen. 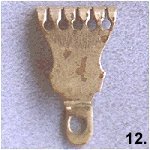 Lyre shaped tailpiece, thin metal cutout or stamping, circa pre-toc. 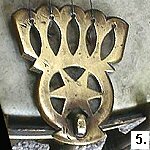 Seen on an Excelsior banjo, from John C. Haynes Co, Boston, MA. No Knot, there were at least 2 distinctly different models, with several variations. 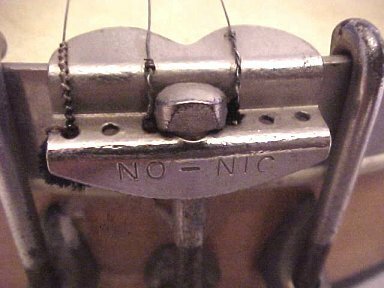 No-Nic, a simple toc tailpiece, obviously intended for use with as many as 6, probably ball end, strings. 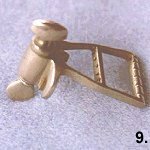 Ode, the Ode name is stamped or engraved near the string slot. These were used on Ode, Muse, and Baldwin banjos. Ome, the Ome name is stamped on the top. Two hex head bolts provide lateral adjustment, and the countersunk mounting bracket screw is unique. 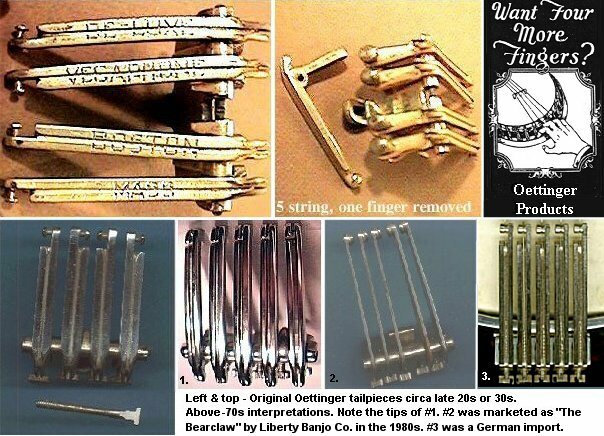 Oettinger, patented by Mark Oettinger, 05/21/1929, they were featured on B&D banjos and high end Vegas. The gold plated, engraved, 5-string model pictured here is rare, most are 4-string. Paramount, found on virtually all but the latest Paramounts; also on some very late Orpheums. 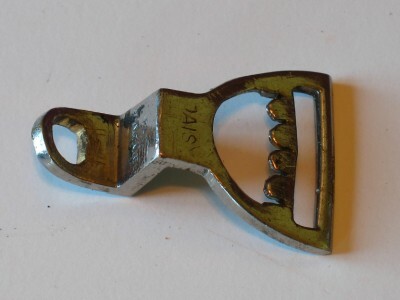 Sold unmarked in later years, so sometimes found on other makes. Patent Jan. 4, 1887, by C.P. Post & G.N. Durkee and assigned to Lyon & Healy. Note that all three types of strings could be used with this design. 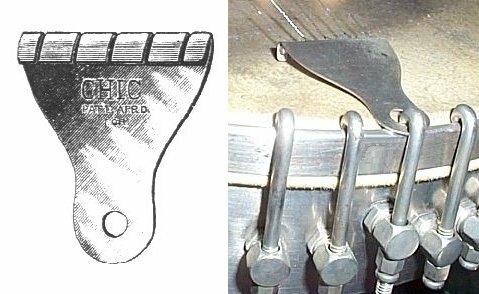 Marketed as the "Perfect Banjo Tailpiece" or "Lightning String Adjuster" by its inventor, Eleanor D. Son, patent issued 02/12/1907. Also sold as the "Bell Brand" by NMSCo. See above. 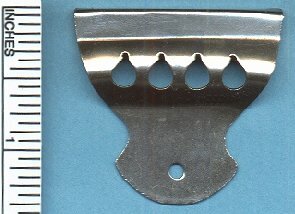 Price SL5, modern tailpiece designed and sold by Gary Price. 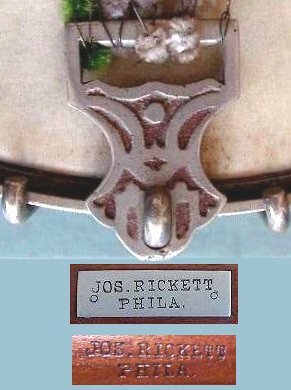 Tailpiece found on banjos marked Joseph Rickett circa 1890s. 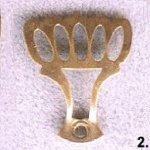 Tailpiece listed in catalog & found on banjos marked J.B. Schall circa 1880s. Eleanor D. Son patent, issued 03/06/1894. 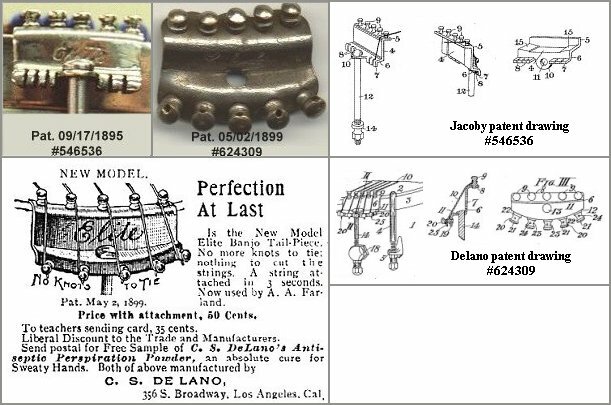 See also "Perfect Banjo Tailpiece" above, for another of her patent tailpieces. 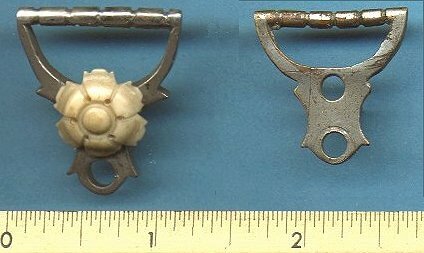 SS Stewart, the "Common Sense" tailpiece showing one with an ivory rosette and one without; lower grade models and later ones had no rosette. Charles & Elmer Stromberg, best known for large bodied jazz guitars, built banjos in the 20s and 30s in Boston, MA. They should not be confused with the Stromberg-Voisinet Company, Chicago, IL predecessor to Kay. Talon, one (on the left) turn-of-the-century, one 1960s reproduction, and a rare 7-string model, each should have a short rod, threaded at both ends, one screws into a hole in the tailpiece, the other accepts a nut. Thompson & Odell, Boston, MA. 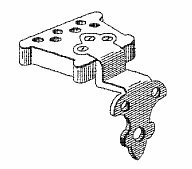 The hinged attachment bolt is similar to the Gerke model. Compare to one offered in Haynes' 1885 catalog. 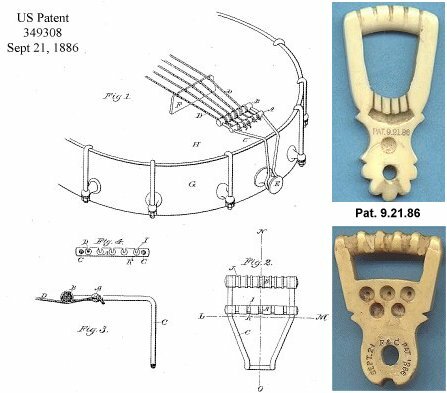 See George Rogers' 1884 patent, #301832. 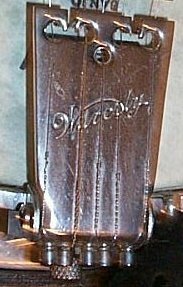 Vega used a variety of high end tailpieces on its fancy banjos. Here are four different Vegaphone tp's. Note how much longer the 5 string Kirschner is than the 4 string. See Oettinger, above, for another. 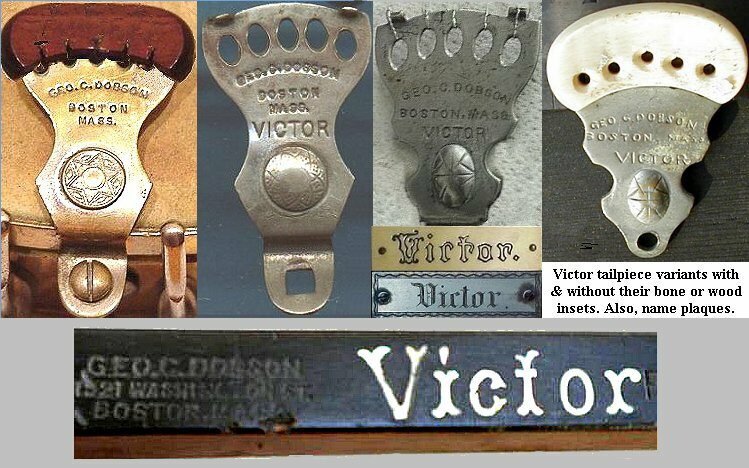 Victor, a tailpiece patented by George Clifton Dobson to go on the Victor model banjos, which were probably made for him by Buckbee. See also Henry C. Dobson, above. Waldo Manufacturing Co, Saginaw, MI. 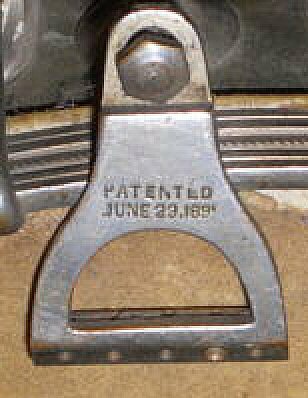 This tailpiece, a neck attachment clamp and a neck angle adjuster were patented by John F. Barrows in 1894. Washburn, found on higher grade instruments. 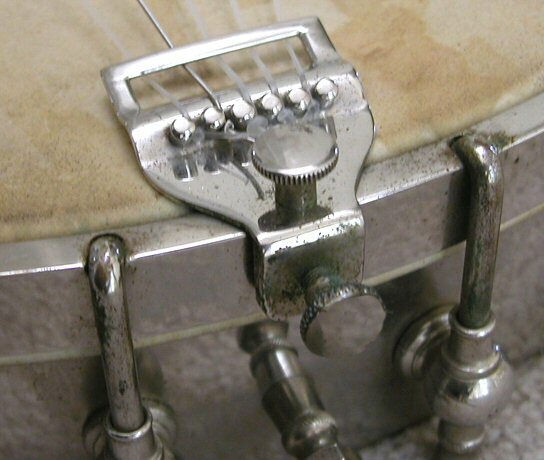 The top thumbscrew attaches the tp to the rim while the other adjusts the angle slightly. Waverly was one of the largest manufacturers of parts and accessories for the musical instrument industry, from before the turn of the century until the 1970s. Waverly, simple 4-string model found on low end banjos and banjo ukuleles. Patented by H.W Weymann and assigned to W.A. Weymann & Son 10/06/1922, it was used on most of the Weymann banjos from the era. Slip on cover is missing. 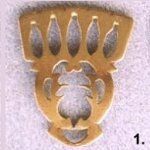 Windsor (British) Pyxe, found on a Windsor "The Monarch" banjo. 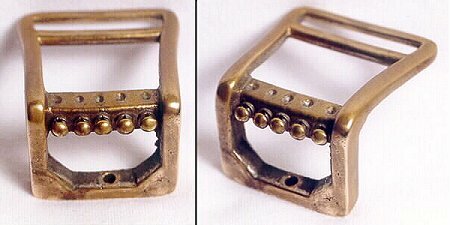 The design is remeniscent of the Lyon & Healy mandolin tailpieces. The other is from a different model. A.G. Wood, patented April 5, 1887, made of copper. Two different models. The middle one is the more common. The large post is to hold the rear end of the strings which are to be "looped, tied, or wrapped in a suitable manner." 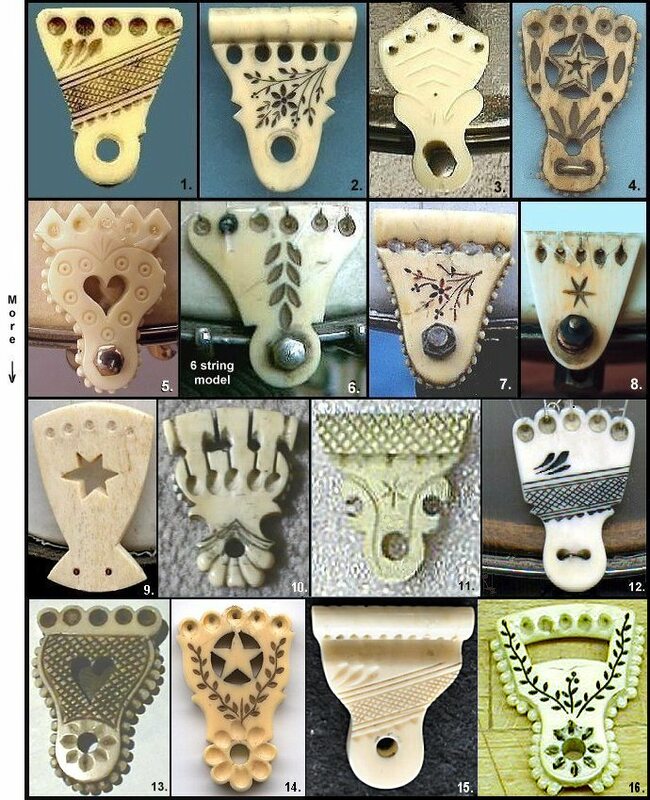 Bone or ivory tailpieces, some with geometric and floral design, found on early Fairbanks, Cole, Bay State, Schall, Stewart, etc. 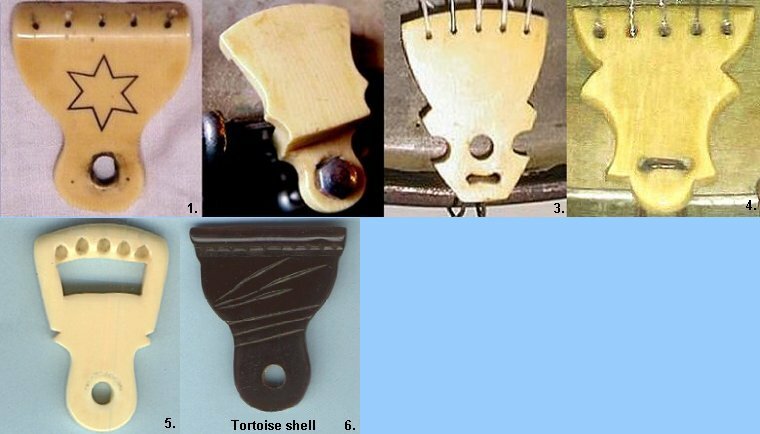 These are still used with gut or nylon strings. Steel strings may cause them to break or shatter. 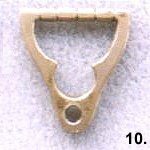 A simple tailpiece, generally found on banjo ukes. 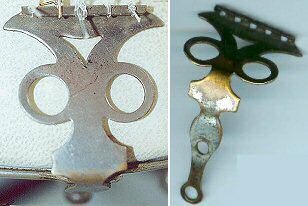 Celluloid, or "ivoroid" as it was called, was developed as a substitute for elephant ivory, and used for tailpieces, tuners and ornamentation. See also Benary, Fairbanks. 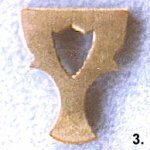 Wooden Tailpices. 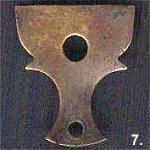 Early commercial tailpieces were often made of wood, frequently ebony. Earliest ones have two small holes to pass the gut through to tie on to the banjo. Later, they were rivited to a metal piece. 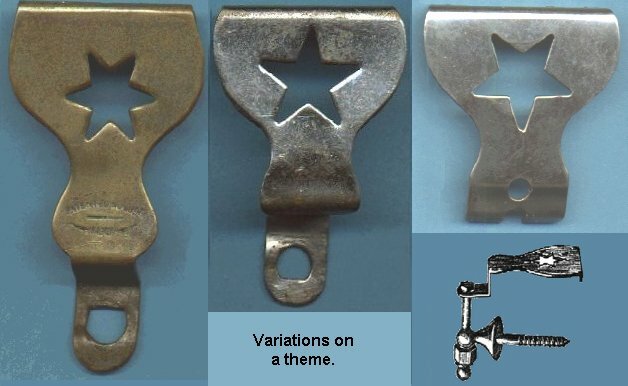 Here are a series of tailpieces with no identification. Anybody recognize one or more? Thanks to Jim Atherton, Duke Beattie, Derek Blomerth, Jeff Carroll, Jeff Chumley, Noel Currie, Wyatt Fawley, Frank Ford, Sante Giuliani, Steve Hanes, Norbert Hausmann, Caitlin Xantha Hazen, Don Hergert, Joe Hornung, Richard Kelley, Jeff Kirchner, Bob Lincoln, Rick Loftus, Calvin Minner, Marc Perdue, Norm Peterson, Bob Pliskin, Annie Roach, Dave Ross, Hank Schwartz, Jay Shannon, Steve Sinerchia, Lew Stern, Juel Ulven, Richard Walker, Stan Werbin, Arni Zobrist, among others, for suggestions, pictures, and descriptions. All others by the author. *I designed a reproduction of the Kershner Unique when I co-owned Minalco with Alberto Vazquez, and we contracted to have them made overseas. However, due to international machinations, (our "overseas agent" tried to cheat us big time), we found out, and let the whole thing revert to the manufacturer, who was and is blameless, as is the present distributor. Even so, it is a great tailpiece.